This is Home Bar Gurls, the segment where another Home Bar Girl or Dude sends a recipe! Today’s recipe comes from Belinda Martin, Stylist to the stars! No really, she recently styled The First Lady of New York City, Mrs Chirlane McCray, for a Halloween Party! Belinda likes, Whiskey, Gin, Rum, Tequila and a good spicy Bloody Mary. 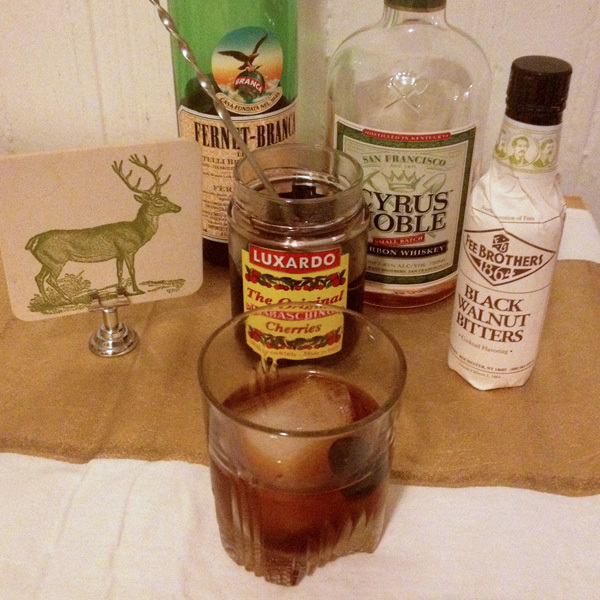 In tin, combine Whiskey, Fernet, Walnut Bitters and Cherry Syrup over ice and stir. Strain into rocks glass, add ice and garnish with cherry. Have a recipe you would like to be featured? Please send a recipe, photo of the cocktail and a bit about yourself to homebargirl@gmail.com.